Tripura government on Thursdaylaunched distribution of Masoor dal every month under public distribution system (PDS) against ration card to each of the family regardless the economic status. The government decided to supply one kg Masoor dal at the cost of Rs 40, which is at less than a half of the market price. Chief Minister Biplab Kumar Deb in presence of the state food and civil supplies minister Manoj Kanti Deb has launched the scheme on Thursday in a programme at Agartala. Addressing the PDS consumers in the programme food minister said that his department also apprised the Chief Minister of supply sugar and edible oil at subsidize rate in PDS. 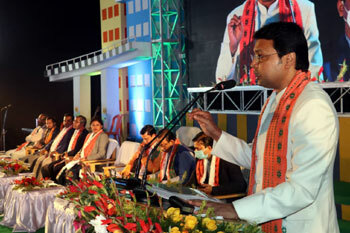 Chief Minister Biplab Deb while addressing the gathering in the programme urged upon the unemployed youths of this state to open Daal mill, and save Rs. 6 crore which goes out in owning daal at subsidized rate from others states like Madhya Pradesh. The Chief Minister hoped that opening a mill in the state shall generate employment for other unemployed section. Chief Minister also said that the centre and the ruling BJP government in the state of Tripura is putting effort to double the farmers' income whereas the previous Left front govenrment has failed to do so rather has brought the farmers in the street and indulged them in joining protest against the centre.